(April 2018) While the “Government Sponsored Entities” that garner most public attention and scrutiny these days are secondary mortgage behemoths Fannie Mae and Freddie Mac, there’s another less-talked-about GSE that serves an important role in the health of our nation’s housing markets: the Federal Home Loan Banks (FHLB). 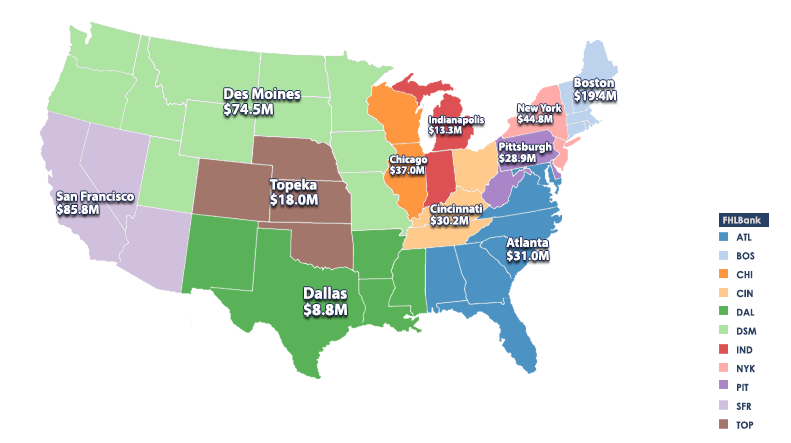 Eleven regional Federal Home Loan Banks cover every state, district and U.S. territory. The FHLB system provides its members – approximately 80% of all lending institutions in the country – with funding and liquidity for residential mortgage origination as well as designated housing and community development programs. Like Fannie Mae and Freddie Mac, the FHLB System is regulated and overseen by the Federal Housing Finance Agency (FHFA). On March 14, 2018, FHFA published a Notice of Proposed Rulemaking in the Federal Register, detailing the planned amendments to the FHLB’s Affordable Housing Program (AHP) and asking for public comment. These amendments introduce major changes to how the AHP is structured, administered and enforced. Currently, pursuant to federal law, each of the 11 Banks must contribute 10% of its annual earnings to an established Affordable Housing Program (AHP). In 2017, AHP funds across the FHLB system nationwide totaled nearly $392 million. AHP funds must be used to finance the purchase, construction, or rehabilitation of either owner-occupied housing for low- or moderate-income households (at or below 80% AMI) or rental housing where at least 20% of units are occupied by very low-income families (at or below 50% AMI). To achieve these objectives, each FHLB creates an annual implementation plan to distribute these AHP funds in its markets through two channels. The first, which is mandatory, is a Competitive Application Program, wherein nonprofit and for-profit groups submit applications for programs to meet the above goals. These applications are reviewed, scored and then awarded by the FHLB based solely on their score. The second, which is optional, is an AHP Homeownership Set-Aside program, wherein a FHLB may allocate up to 35% of its total AHP fund (or $4.5 million, whichever is higher) to be distributed as subsidies to eligible households. These subsidies, which currently max out at $15,000 per household, can be used by owner-occupants to pay for down payments, closing costs, counseling costs, or rehabilitation assistance. To discourage “flipping”, subsidy recipients must enter into a five-year retention agreement restricting them from resale (except to an otherwise qualified low-to-moderate owner occupant), the penalty for which is repayment of the subsidy. FHFA’s proposed amendments to the AHP system replace the Competitive Application Program with a General Fund that functions similarly, through which no less than 50% of annual AHP funds must be distributed. Separately, a FHLB can opt to designate up to 40% of its AHP funds to Targeted Funds designed to meet specific affordable housing needs in their markets. For example, in an area struggling to recover from natural disasters, a FHLB can create a Targeted Fund to address these disaster-related affordable housing needs, so that applicants looking to provide this targeted assistance are competing only with each other, and not with every applicant under the General Fund. Targeted Funds must still be applied for and awarded competitively. The proposed AHP amendments retain the optional Homeownership Set-Aside program and increase the amount a FHLB can designate from 35% to 40% annually. The per-household subsidy maximum is also increased, from $15,000 to $22,000, and an annual upward adjustment based on the FHFA house price index is also added. This subsidy increase may provide greater relief to families in higher-cost housing markets. If you have questions or comments, please contact Julia Gordon. This column was originally published in April 2018.